Articulated, rigid shell knee pad with heavy elastic that has a Velcro adjustment feature. Designed to be used in the most severe conditions such as cell extraction or direct contact during riot control. 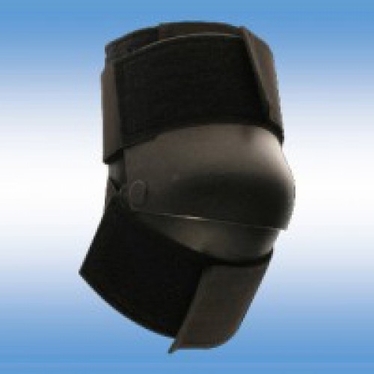 Articulated shell fully protects knee from above and below beyond standard style knee pads. The hard shell resists penetration from sharp or pointed objects. Designed to be worn loosely for comfort and then quickly tightened before conflict.